Shannon began working with clay while studying at Bristol School of Art. Shannon went onto develop her creative skills while studying Contemporary Crafts at Falmouth University. As a part of her course, she had the opportunity to explore many different mediums and particularly thrived in the art of paper cutting and installation. However, her interest in ceramics never waned and she began volunteering on the weekends at the Leach Pottery, gaining valuable experience in studio production and an understanding of the Leach ethos. After graduating from University, Shannon successfully exhibited her paper cuttings in exhibitions such as, New Designers, One Year On and a solo show at Linley’s London. 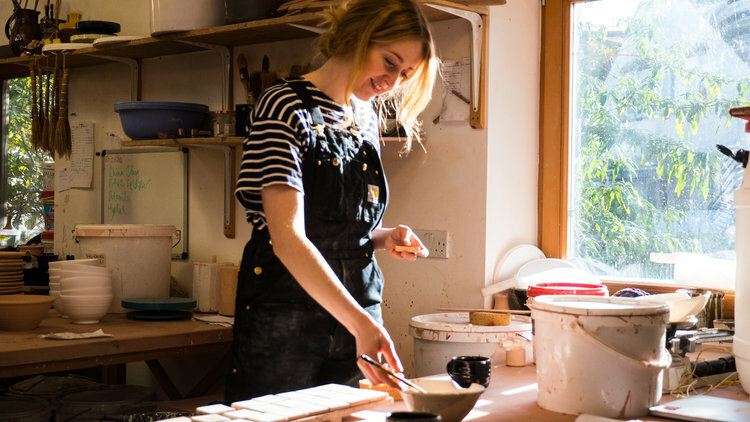 She returned to the Leach Pottery in 2017 as a full time volunteer and since being a member of the team has improved her skills as a production potter and discovered a real passion for decoration and brushwork.